Since I was a little girl I have always felt the need to create. I consider myself a serious “doodler” – pencil in hand, I just love making lines and patterns. Color had always intimidated me, because I didn’t enjoy the mess of mixing paints and I didn’t have the color confidence to select the right colors. Fabric was a welcome relief to my dilemma– colors came already “pre-mixed” – no color charts, no mess, no fuss AND I could work with them anywhere in the house. I do love painting on fabric now, which I happily cut up and use in my fabric art. The sewing machine didn’t enter my life until I was 30 years old. I had purchased one as a young mother feeling it was my duty to own one. The sewing machine sat in a closet till the day I saw my first quilt. Having drawn and taken art lessons since I was 6 years old, I figured that if I could draw it, I could figure out how to sew it. Even though my first projects were far from perfect, I loved working with fabric and couldn’t wait to get to the quilting stage to add the wonderful texture to the surface. I pursued German and Russian languages in college, thinking I would pursue a career as a translator, but spent time in a German commercial bank instead, then switched to doing pen & ink renderings of houses for real estate companies and homeowners so that I could be home with my children. Next I dabbled in real estate as a sales agent, however, when I realized that I was drawing more houses than selling them, I finally listened to the artist within me and pursued a career in art. 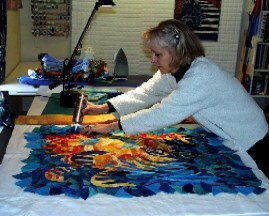 In 1996 I started making art quilts, which were very well received in national and international shows. The awards encouraged me to move forward in my new direction. My hobby officially became my business in 2002 when I opened my business “The Quilted Lizard.” For 8 years I taught at a local quilt store and in 2002 I began teaching my technique “Layered Curves” and “Accidental Landscapes™” nationwide. Teaching workshops gives me the opportunity to share my passion for playing with fabric with others, and I love it!! Where does the name “Quilted Lizard” come from? Lizards make me laugh. They’re tiny and cute, and scurry around with amazing speed. I began including lizards in my quilts and loved the smiles and laughs (and blue ribbons) when people looked at my whimsical creations. Over the years I realized that I had collected quite a few lizard pins, belts, t-shirts, hats…. So when it came time to name my company I wanted a mascot that would make people smile.